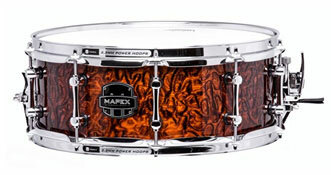 The Mapex Drum Company has introduced "The Armory" series of snare drums. The five specially crafted snare drums include pro-level features, such as 2.3mm Powerhoops, unique tube lugs, piston-action strainers, and Black Panther snare wires with brass end-plates and stainless steel music wire coils. Additionally, the three wood-shell models include Mapex's new SONIClear™ Bearing Edge, enabling easier tuning, a powerful and focused tone, and enhanced shell-vibration.